to the modern Air Buddy. U.S. and foreign patents. First introduced to the market in 1997, this was the single most popular new piece of gear at the 1998 DEMA (Diving Equipment Marketing Association) Convention. It was also featured at other diving shows such as the prestigious "Beneath The Sea" show in New Jersey and "Ocean Fest" in Florida. Now you will find it being used throughout the U.S.A., Japan, Palau, Canada, Mexico, Truk, South Africa, Egypt, Iceland, Germany, Italy, Korea, Okinawa, Great Britain, The West Indies, United Arab Emirates, Sweden, Israel, Brazil, Columbia, Australia and many more dive sites. As advertised in the PADI "Undersea Journal" and "Sport Diver Magazine"
The Air Buddy is a miniature regulator second stage from which all the complicated and delicate parts have been removed, leaving only one moving part, the tilt valve. In a normal second stage, inhaling causes the diaphragm to move inward, pressing a lever which opens the needle valve allowing air from the low pressure hose to flow into your mouth. We replaced the needle valve with a heavy duty tilt valve in the Air Buddy. To open the tilt valve in the Air Buddy, you simply squeeze the mouthpiece with a biting movement of your mouth. That releases the air from the low pressure hose, giving you PPAS. Positive Pressure Air Source means that your mouth will be flooded with air at a higher pressure than that of the water around you, no matter what your depth may be, gently forcing the water out of your mouth and allowing you to breathe. The air comes to you as slightly above ambient pressure no matter what your depth. You stop the air by relaxing your pressure on the mouthpiece. The Air Buddy comes in two models. You see the two models on the right. The first one is the orignal AB911 which was designed to give the diver enough air to breathe at any normal sport diving depth. It worked very well. It is the one without the nylon ring. However, when it was offered to the Navy, they told us that simply giving enough air to breathe at sport depths was not good enough for them. They needed it to breathe at any depth a diver might take it. They also needed it to provide enough air so a diver could be under the stress of carrying a load, swimming against a current or being tired and just needing more than a bare minimum of air. The AB911 wouldn't do that. So we designed the AB2000. You see that in the picture with the green nylon ring. That model will deliver more air as you increase your pressure on the mouthpiece. It will provide all the air you need in any situation as long as you have air left in your tank. It is also nitrox compatible. The AB911 does not provide enough air to blow the Air Buddy Storm Whistle. The AB2000 does. It also provides enough air to fill a lift bag. Be aware that the AB911 and the AB2000 are sold at different prices. If you have an AB911 you can always have it upgraded to an AB2000 for a modest fee from Sea Turtle Scuba. Inc. 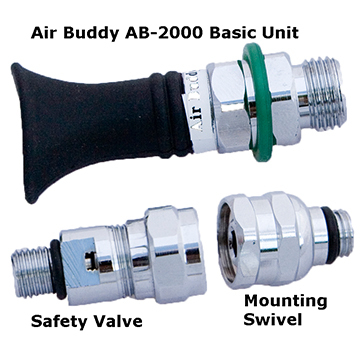 The Air Buddy comes in three convenient configurations with either the AB911 or the AB2000. It comes mounted on a low pressure Octopus Hose to be mounted on your regulator first stage, replacing the old fashioned "second stage" model octopus. That's the Air Buddy on the yellow hose, just about the same diameter as the hose. It comes mounted on a quick connect mechanism that snaps onto the power inflator of your BCD, as shown in use in the picture. It does not change the function of your BCD in any way. It comes with a swivel adapter ( at left) to mount directly onto a standard regulator 1st stage to make it a super pony bottle. At right is what a 6 cu.ft. pony bottle looks like with the Air Buddy installed on a regulator first stage. 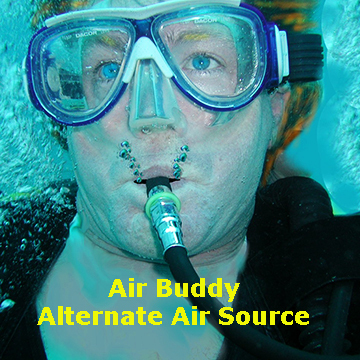 The Air Buddy is the safest source of emergency air now available. It just sits there until you need it, and then it works, every time. The Air Buddy as a signal device. The Air Buddy is not just an alternate air souce, it functions, with the Air Buddy Storm Whistle as the loudest scuba signal device you can buy. Just hold it against the mouthpiece of the whistle and squeeze the Air Buddy. It can be heard up to 1/2 mile away. 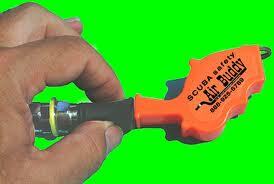 It does not have that range under water, but you can use it to signal your dive buddy while submerged. The Air Buddy Storm Whistle can also be blown by your mouth and is still the loudest whistle you can own. The Air Buddy comes with your choice of an octopus hose or a quick connect mounting for your BCD or a swivel mount and safety valve to mount on a regulator first stage pony bottle. we offer you a 30 day, unconditional money back guarantee of your purchase price.